Original CSF-3 Super Feeder serviceable for years to come, made in USA and sold by Super-Feed for over 23 years! All parts readily available and easy to replace if ever needed. Adjust it from very tiny to larger portions up to 48 times per day. A very easy to program analog timer is included. 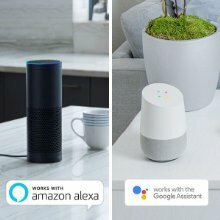 Some Wi-Fi/automation/voice command systems may also be used with Wi-Fi plug. See how Google example works for a customer using voice activation. Our most popular automatic Multi Purpose cat Super Feeder® combo features a special dishwasher-safe bowl made out of a special high-grade kitchenware material known as SAN by Kibisan® and especially designed to spread kibbles for better food access to pets (round stainless steel bowl also available by request-see bottom of page). It also features new high quality and practically indestructible polycarbonate 2-cup clear extensions. It comes with the ACAT-23 analog timer which is very easy to program using tiny pins to trigger the feeder up to 48 times per day. The metal black powder coated mounting bracket and strap attach the feeder to the compact heavy-duty black ABS base and tower. 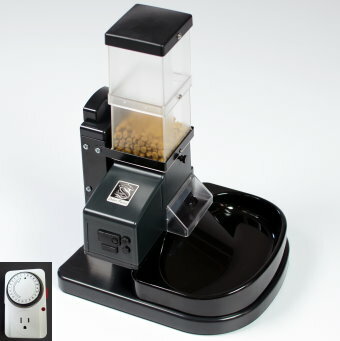 The Super Feeder® could also be used with a home automation system and/or web based system. It is compact and holds 4 and 3/4 cups of food (about 1.5 lb of food). Its capacity can be increased later with extra 2-cup clear extensions or 1.5 gallon hopper available from Super-Feed®. If you have a really aggressive "locksmith" cat when it comes to trying to get to the food, a polycarbonate chute cover (protective device) is also installed. You can trigger multiple feeders at a time with one timer! Not only is it extremely dependable, versatile and easy to operate, but it comes with personalized customer support. It only needs minor assembly with only a supplied screwdriver. Proudly made in USA, try one, you'll love it as many other pet owners do! Its compact size mounted is 10" x 11" x 15" tall and is normally placed backed up to a wall, cabinet or across a corner wall. Most importantly, compared to others, it could also be mounted to a wall or your very own mount using a piece of lumber instead of the supplied short stand for that smart and highly mischievous cat! Do not install this particular feeder with stand outdoors not properly protected (check out combos 23 and 23a). This stand set up is intended for INDOOR use only. Voltage required: Power supply (supplied) 110-240VAC 50-60Hz 12VDC output, all timers 120V 60Hz-USA style plugs only-no batteries required. If you hate assembly of anything, this ready to use CSF-3 Super Feeder like this one is for you! NOTE! USING A NAME BRAND LIKE "SCIENCE DIET" IS ONLY A BRAND EXAMPLE. This is the second CSF-3 I've purchased. The first has performed great, and when I needed a second auto-feeder for a second cat, I decided to get the same model. When I set out a bowl of food, my cat was gorging and throwing up. Now he gets a little food every few hours. He still throws up occasionally (he's a cat! ), but at least now it's not messy piles of wasted food. This is a great product, and I'm glad to support American jobs. I got this automatic feeder for my mom for Christmas because our cats would wake her up howling every morning to be fed around 5 a.m. before her alarm would go off. Now, they're content to be fed early while she gets to sleep in and she calls me to thank me for buying her "the gift of sleep" about once a month. :) The employees processing and shipping my order were so helpful too. I highly recommend this product! Excellence in Engineering, best $150 I've spent in the last year! We needed to find a an automatic feeder for our picky & puky kitty. We tried all the slow feed bowls and dishes, coming home on lunch, waking up in the middle of the night, but we just couldn't get the portions right. Either our cat would gobble the food to quickly and vomit or she wasn't getting enough small feeding throughout the day because we just weren't home enough. The Supper Feeder has solved these problems and probably save our cat. We're now able to schedule several, like over 30, small feedings a day. Enough food to maintain her weight and enough to no make her vomit it back up. And to boot the thing runs all by it's self. All we have to do is top the hopper off once a week. Our cat is now dissociating feeding time with us and associating feeding time with the tinkle-tinkle of the super feeder. She's less meowy in the mornings and just as cuddly at night. Best $150 I've spent on myself & the cat in a long time. Thanks! Well made product, performs as promised! Purchased two of this model- one for indoor cat and the other for an outdoor cat for when we went on vacation. Continue to use them as automatic feeders even when we are in town. The feeder arrived as promised and was easy to assemble. The instructions were clear and precise. The quality was good and it worked as advertised. I like that any parts can be replaced individually and that the timer is not built in. I'm planning on this lasting for a very long time. I was hesitant to spend the money on this feeder. I was skeptical that it would be reliable, right amount of food delivered at the right times, every time. I have found it to be totally reliable, amounts are correct and right on time. I would recommend it to anyone looking for a solution to accurate feedings multiple times a day. After years of adjusting my cats intake, I am free. Food comes 5. Times a day. Love watching her anticipate the arrival of a meal. I decided to purchase this product at the recommendation of my sister, who has owned it for over a year. After owning the Super-Feeder for a couple of weeks, I am very impressed. Set up was super easy with the video the company provides. I have the control to decide exactly how much and when the food will dispense. Also, the customer service from owner Gerard was unexpected and appreciated. I ordered the feeder last minute after discovering I needed to leave town suddenly, with no one to feed my cat. I ordered with 3 day shipping, but after FedEx failed to pick up the package, I got a phone call from Gerard as well as an email letting me know that I could reorder with faster shipping. I would imagine if I had any problems in the future, the company would do anything to help me. Definitely recommend. I have a cat that requires multiple small feedings during the day. The Super-Feeder with the analog timer was the only feeder that did the full job. My only problem was determining which tool was to be used for the fine increment adjustment of the amount of food to be dispensed. The little adjustment tool for the food dispensing amount should be labeled in such a way that it is not used where the Phillips head screw driver should be use. Fortunately, I didn't break the delicate little thing. So far I have not had to adjust the amount of food again. I am not sure that the little delicate tool would make it through another adjustment session. I have been using this feeder for about a week, and so far am very satisfied with it. The video was very helpful in setting it up-- I followed it step by step and had no problems with the set up at all. I like the ruggedness of this feeder, the small footprint (although I wish the two clear extensions were larger, but now that I've used it for a few days, I will order the large hopper), and the mechanical design. I am using Purina Healthy Metabolism food which is NOT round and smooth, but has odd shapes. Although Superfeeder recommends smooth round kibble, this food seems to be working fine so far. I purchase the analog timer version, but am not using that time-- I had a digital one and am running it on that without any problem. 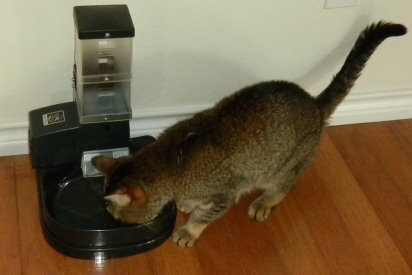 Over the past 8 years, I have purchased 3 Ergo auto pet feeders. One is still running but on the other two, the augers broke (one after 7.5 years and one after six months!). I've always disliked the design of the Ergo feeder. The mechanics of the auger can cause food to get stuck in the auger (which broke the two I owned), it is extremely difficult to take apart to clean, and even the smallest version has a large footprint. Providing no problems develop with the Superfeeder down the road, I have switched from Ergo to Superfeeder for future purchases. Very happy with cat feeder! After researching all the different cat feeders I decided to go with the Super feeder. I needed a dependable machine that would dispense at least 8 times a day and a teaspoon at a time. I went with the analog timer because if needed I could feed more than 8 times, otherwise I would have purchased the digital timer. Our cat has a deformity of her esophagus and only allows extremely small portions of food or she will throw it up. We went away for 2 days and had my daughter check on her and the machine is working amazingly well! put it together with no problem. The tricky part for me was the timer. So far it's great! I called the company and explained what I needed and they immediately responded with their recommendations. So far could not be any happier. It's been a week that we've been using this product. if you have special feeding requirements, then this is what you are looking for. I feed my cat 12 meals a day, 1/16 cup per feeding. Try doing that with any other feeder! Not a perfect score because Of the high price. This is the best feeder, worth every penny. We have a cat with feeding issues and the timed feeder has changed her life. She is more active, playful and not been sick since we started using this. It took her 2 feeding cycles and she had it all figured out. She tried to get food out, but was unable. Great Feeder. Awesome product extremely sturdy and durable productt. My cat sit it by waiting for machine to dispese food. Really liked the video on how to Assemble feeder. It was extrem my helpful. I really like that you can replace parts should it break versus throwing feeder out. Very sturdy product. Very happy with purchase. My boyfriend is an engineer and is very impressed with development of this feeder. My kitty boyz no longer associate me with food. Excellent program induct! Great unit! The dog tried twice to destroy it and failed. But the second time, she got close. So we had to move it up to a shelf where the dog couldn't get to. I understand that the screws that hold the cap onto the feeder reserve is really sturdy. I just wonder why a snap-on solution could not have been developed. I did a lot of research before purchasing this feeder and I was not disappointed. Works great, easy to set up, plenty of capacity for our single cat. Though priced higher than other feeders, it's worth it. The instructional videos are excellent and made the assembly a snap. For a first buy, this one is great. Have been using it almost a week and it hasn't missed a beat. Just got the analog timer and it is good. I get leery of the digital ones. I got another extenson, so now have 3 attached. Hardest to train the cat not to beg me for food when it gets close to the feeding times, but it is learning. Will love not having to drag the cat out when we are gone for a few days, since the cat doesn't like that. The feeder works very well. However, the timer you sent didn't. I finally switched it out with the timer for the Christmas tree lights!